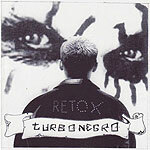 Described by one critic as "Norway's best gay punk rock band," Turbonegro has toned down the outrageousness of its song titles the last few years as the band aims for commercial breakthrough. Or at least a few songs that can get played on radio stations. Still, with songs like "We're Gonna Drop the Atom Bomb," "Everybody Loves a Chubby Boy," "Hell Toupee" and "Welcome to the Garbage Dump" on their newest album, it's not like they've gone Pat Boone on us. Formed in Oslo over a decade ago, the band has always sung in English (not uncommon among European rock bands). The music here remains a cross between Kiss and Slayer with touches of punk and alt rock, with an emphasis on the sort of tongue in cheek humor Kiss incorporated into their music. It's the kind of over-the-top rock excess that is as fun as it is politically incorrect.